After making its global debut in Taipei City last May which saw 12,000 participants, Singapore will be the second country in which the One Piece Run would be held at on the 6th of March 2016 before concluding in Okinawa, Japan. Featuring key episodes, the anime themed run allows fans to enter the world of Luffy, the anime’s main protagonist. Join Luffy and embark on an exciting journey in search of the ultimate treasure “One Piece” to become the next Pirate King! Delivering an experience that celebrates the camaraderie of One Piece with sport spirit, the fun run aims to unite about 10,000 runners and anime fans over a marathon course that takes them through different experiential zones before finishing at the One Piece-themed village. With thanks to Avex Asia Pte. 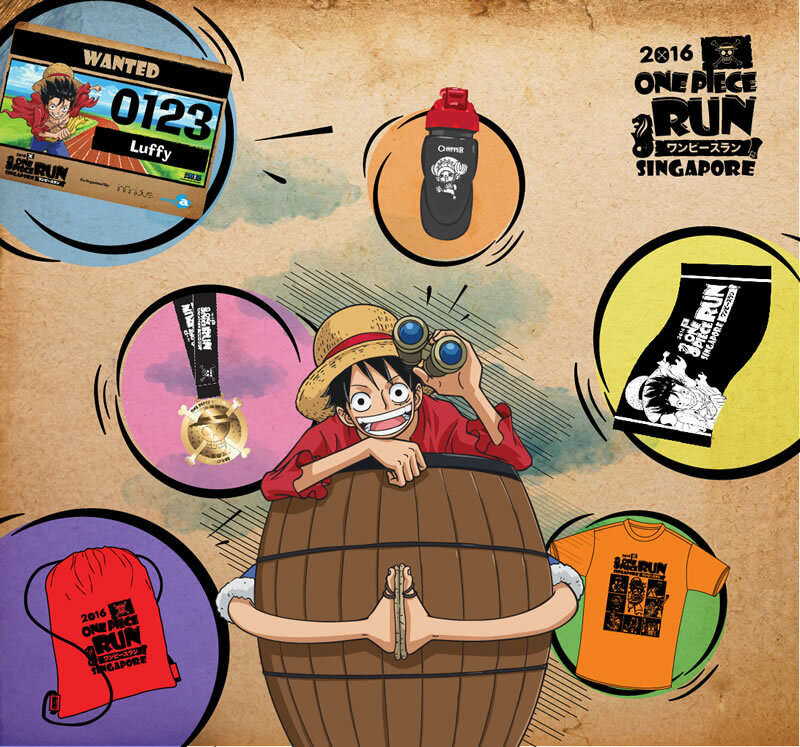 Ltd., POPCulture Online is pleased to announce that we have 2 pairs of One Piece Run race passes worth SGD$138 to give away! All You have to do is tell us what is Luffy’s full name. To earn an extra chance, do like the giveaway post over at our Facebook Page and share it on your timeline. Remember to set it to public and email us your Facebook user name as well so that we can track and add to your chance of winning the pair of passes! The contest will close on 7th Feb 2016 2359Hrs Singapore time (GMT+8). The 2 winners will be notified via email on the 8th of Feb 2016 with instructions on how to redeem their passes. POPCulture Online reserves the right to amend these terms and conditions without prior notice. This usually doesn’t happen unless someone bribes us with the Pirate King, Gol D. Roger’s legendary treasure. The decision of the POPCulture Online team is as final. Only one entry per person is allowed. Duplicate entries will be detected by our tech guy’s great clone detecting software. Attack of the Clones is over and Disney has bought the Star War series so let’s leave it as that. Winning entries will be subjected to terms, conditions and rules set by event organisers themselves. We will not beg, plead or bribe the event organisers to let you back in if you break a rule and get thrown out. Please ensure personal particulars are accurate as these will be our means of contacting you if needed. All personal information will only be kept for verification purposes (if any). We value our privacy and do not enjoy getting spam calls or emails and we know you would like your privacy protected as well. POPCulture Online is responsible for the execution of this giveaway so winners please make sure you follow the redemption instructions properly as we will not be responsible if you accidentally void your passes. POPCulture Online team members are not allowed to take part in this giveaway. Everyone else is ok although girlfriends, boyfriends, wives or husbands are not allowed to threaten their respective partners who are in POPCulture Online to ensure that they win. POPCulture Online is not responsible if winners are unable to make it for event day itself and no refund of any kind will be given. So make sure you get 7 hours of sleep and drink lots of water the day before and set your alarm clock. POPCulture Online is not responsible for any passes not redemmed and no amount of bribing, threatening or pleading will get us to surrender those passes. Do remember to like both the POPCulture Online and One Piece Run SG Facebook page to stay updated for the latest news for the event!